Persepolis, the unique heart of the world powers in history, is the land which Darius the Great established around 559 B. C. as a multicultural civilization that was replete with an atmosphere of tolerance, moderation, and dignity of mankind represented especially in its architecture. The Persian style of the architecture of Persepolis is in fact the outcome of the cooperation architects whom Darius the Great invited from Lybia, Egypt, etc. and Persian architects. The great king established a tremendous palace based on Mesopotamian models. That is why Persepolis is recognized by UNESCO as a World Heritage Site. Darius the Great made Persepolis the new ceremonial capital of Persia instead of Pasargadae which was the burial place of Cyrus the Great. The largest and most outstanding building in Persepolis ia Apadana Palace with 72 columns. The first westerner to visit Persepolis in 1602 was Antonio de Gouveia from Portugal who was exploring cuneiform inscriptions. The first scentific research in Persepolis was performed by Ernst Herfeld in 1931, backed by the Oriental Institute of the University of Chicago. He asserted that Persepolis was constructed to show a majestic atmosphere symbolizing the Persian Empire and to celebrate special events like Nowrouz. One of the evident architectural features of Persepolis is its columns made of wood and stone. Generally, buildings in Perspolis include three segments; the military compartments, the treasury stores, and the welcome houses for the kings. These included the Great Stairway, the Gate of Nations (Xerxes), the Apadana palace of Darius, the Hall of a Hundred Columns, the Tripylon Hall and Tachara palace of Darius, the Hadish palace of Xerxes, the palace of Artaxerxes III, the Imperial Treasury, the Royal Stables and the Chariot house. 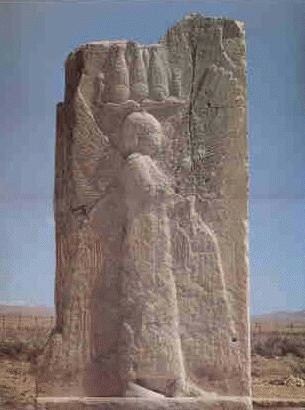 Gray limestone was the major material used to construct Perspolis. The top terrace is 20 meters above the ground and has a broad stairway. It is symmetrically built and has 111 steps which are 6.9 meters wide with 31 centimeter treads and 10 centimeter rises. These stairs are built this way in order to permit noble visitors to walk up with a noble appearance as the distance between steps is small. Main tunnels for sewage are dug underground through the rocks. The architectural plan of the Persepolis is uneven, making it like a fortified castle with angled walls which allowed its defenders target any dangerous invaders. It is believed that Persepolis had three walls with ramparts. The first wall was 7 meters high, the second being 14 meters, and the third 27 meters. Everyone who entered Persepolis came through the Gate of All Nations (Karibu Gateway). It had 2 exits, one that led towards the Apadana audience hall, and the other to "Army Street" and probably barracks. Delegations waited here before being allowed to continue to the Apadana audience hall. A chief usher sat on a bench which was exactly the right height to see into the audience hall. The creatures depicted are karibus, winged chimeras of man and bull. They are supernatural guardians, the cherubim of the Bible. They also feature in older Assyrian art, and are a deep-rooted icon of Mesopotamian culture. 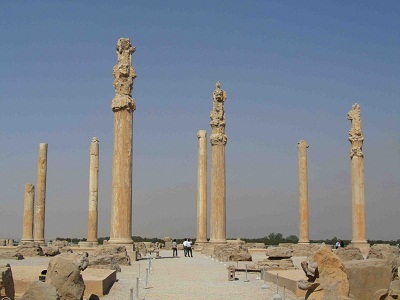 Though Perspolis was burnt to the ground in 331 B. C. it is still one of the wonders of the world and its ruins are emblems of ancient Persian Civilization. The monumental Sassanid-era sites around modern Firuz Abad are the remains of structures originally built by the founder of the Sassanid empire, Ardashir Babakan, in the third century BC. Firuz Abad was once an important stop on the Sassanid roadway between Shiraz and the ancient port of Shiraf. Today it is mainly a Qashqaii farming town. Coming from Shiraz, the first site is Qal’eh-e Dokhtar, a three-tiered palace sitting atop a steep hill. You will know you are there when you see a footbridge crossing the road. Take the bridge and it is a 20-minute climb. Made of rock and gypsum, this palace was Ardashir’s first, and its position and fortification reflect the lingering Parthian threat of the time. While, crumbling, it is not difficult to imagine the palace’s original layout, and the views from the top are magnificent. A 20-minute drive away, Ardashir’s Palace is a much grander structure built beside a spring once Ardashir felt more secure. Given it is almost 1800 years old, its domes high iwans and clean, stable lines- which set the tone for all Sassanid architecture- remain hugely impressive. Beyond Ardashir’s Palace once lay his city, Gur, which in its current form is an archaeologist’s dream, but requires plenty of imagination. With its perfectly circular plan, divided into equal sectors and separated by high walls, Gur was a hugely ambitious town-planning feat. The only existing building is the 30 meter-high ‘minaret’ that marked the center of the circle. Gur is about 3 km along the sealed road between Firuz Abad and Ardashir’s Palace. Begun under the Cyrus the Great in about 546 BC, the city of Pasargadae was quickly superseded by Darius I’s magnificent palace at Persepolis. Pasargadae is about 50 km north of Persepolis and many travelers have asserted that it is worth the effort of getting there. The site is nearly as well prepared as Persepolis, but is beautiful in a lonely, windswept way. The easy-to-discern remnants of Darius’ Garden have recently been added to the World Heritage list as part of a joint entry for Persian Gardens. The austere and awesomely simple Tomb of Cyrus stands proudly on the Morghab Plain. It consists of six stone tiers with a modest rectangular burial chamber above, and its unique architecture combines elements of the entire major civilizations Cyrus had conquered. During the Achaemenid period it was surrounded by gardens and protected, but was plundered by the armies of Alexander the Great, an act that greatly distressed the Macedonian conqueror. About 1 km north of the tomb begin the substantial remains of the early Achaemenid empire. Cyrus’s Private Palace is first, notable for its unusual plan, central hall of 30 columns (the stumps of which remain), and wide verandahs front and back. About 250 m southeast is the rectangular Audience Palace, which once had an 18 m-high hypostyle hall surrounded by smaller balconies. One of the eight white limestone columns has been reconstructed on its uncommon black limestone plinth. In both the Audience Palace and in Cyrus’s Private Palace there is a cuneiform inscription that reads: “I am Cyrus, the Achaemenid King”. Another 500 m north of Cyrus’s Private Palace are the remains of the Prison of Solomon (Zendan-e Soleiman), variously thought to be a fire temple, tomb, sun dial or store. On the hill beyond is the Tal-e Takht, which was actually a monumental 6000-square meter citadel used from Cyrus’s time until the late Sassanid period. 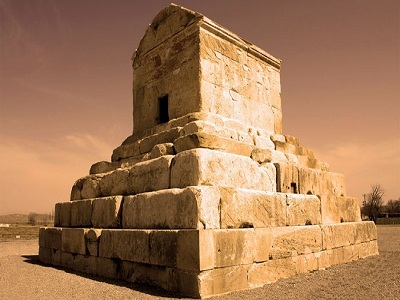 Local historians believe the references to Solomon date from the Arab conquest, when the inhabitants of Pasargadae renamed the sites with Islamic names to prevent their destruction. 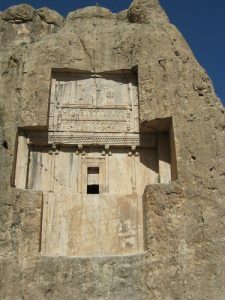 The rock tombs are certainly worth visiting as part of your trip to Persepolis. Hewn out of a cliff high above the ground, the four tombs are believed to be those of Darius II, Artaxerxes I, Darius I, and Xerxes I (from left to right as you look at the cliff) although historians are still debating this. The tombs of the later Artaxerxes above Persepolis were modeled on these. The reliefs of the openings to the funerary chambers are similar to those thrones at Persepolis, with the kings standing on thrones supported by figures representing the subject nations below. The seven Sassanid stone reliefs cut into the cliff depict scenes of imperial conquests and royal ceremonies; there are detailed descriptions in front of the tombs and reliefs. Facing the cliff is the Bun Khanak (Central Home). This was long thought to be an Achamaemenid fire temple, but scholars now argue that it might have been a treasury. The walls are marked with inscriptions cataloguing later Sassanid victories. A shimmering mosque with amazing ceramic work, built in 1617.This small mosque was built during Shah Abbas’ time and dedicated to his father in law, Sheikh Lotfollah. The pale tiles on the dome change colour from cream to pink, depending on the light conditions; and the mosque is unusual because it has no minaret or courtyard. The mosque was once called the Ladies’s Mosque, because there is apparently a tunnel between this mosque and the Ali Qapu Palace, allowing Ladies from court’s royal haram to attend prayers without being seen in public. 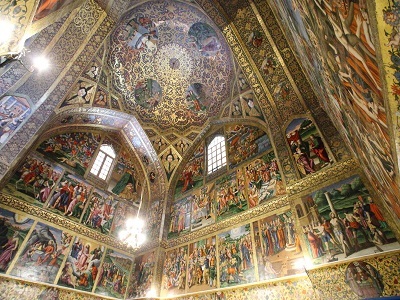 A Christian cathedral with lavish interior similar to a Persian mosque.Also known as The Church of the holy saviour, located in Jolfa, the Armenian quarter of Isfahan. Shah Abbas in 1603 settled the Armenian community from the town of Jolfa on the Aras river (north west of Iran)in Azerbaijan to Jolfa in Isfahan.Vank Cathedral is a focal point and the main historical Armenian architecture in Iran. The cathedral is domed in the same manner as the mosques, the wall and ceiling is covered with magnificent Christian imagery, fine painting and tile works. With two mysterious towers which oscillate together when a visitor sways inside them.These twin minarets belong to a 14th century Mongol mosque and have a unique feature, when one of the minarets shaken, the movement transmit to its twin minaret and it shakes as well. So far there is no convenience explanation for this unusual phenomenon. The ruins of a Zoroastrian, part-Mongol edifice.Located at top of the hill and the place of worship for Zoroastrians. The Zayandeh Rud (river) starts in the Zagros Mountains, flows from west to east through the heart of Isfahan, and dries up in the Kavir desert. The bridges over the river include some of the nicest architecture in Isfahan. The oldest bridge is the “Pol-e Shahrestan” which was probably built in the 12th century during the Seljuk period. Further upstream is the “Pol-e Khaju” A magnificent structure with two tiers of arches which was built by Shah Abbas II in 1650. It is 123 metres long with 24 arches, and it also serves as a sluice gate. The next bridge is the “Pol-e Jubi”. It was originally built as an aqueduct to supply the palace gardens on the north bank of the river. the (Bridge of 33 Arches) or “Allah-verdi Khan Bridge” built in 1632 by Shah Abbas on the Zayandeh Rud, it linked Isfahan with the Armenian suburb of Jolfa. 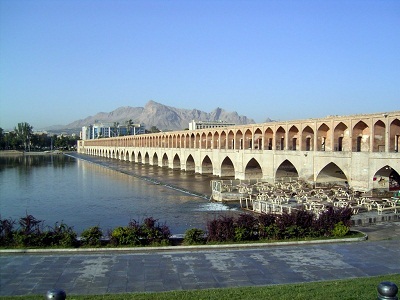 It is by far the longest bridge in Isfahan at 295m, an elaborate example of Safavid bridge design. It consists of two rows of 33 arches. There is a larger base plank at the start of the bridge where the Zayandeh river lows under it, supporting a tea house, Where one can admire the beauty of its impressive architecture. A building typifying nine centuries of Iranian sacred architecture, with vaulted arches, stucco carvings, and a marble pool.With no doubt Friday mosque is an architectural treasure and one of the most magnificent of all building in Isfahan, the architecture of the mosque is extremely complex and constructed in different periods, hence an exhibition of arts belong to different era. It was build on the remain of a Sassanid fire temple at 10th century, there are some columns which suggest its pre-Islamic origin. The mosque frequently built onto damaged and reconstructed, at different times. The main part belongs to 11th century of the era of the Seljuks. Later extensively redecorated and repaired by the Mongols. 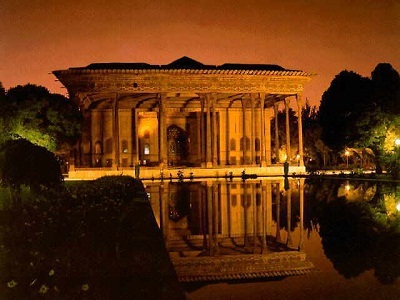 (‘The Forty Columns’) a Safavid palace with a delightful pavilion supported by twenty columns, which double to make the legendary forty when reflected in the water. Inside are important murals, mirror mosaics and an exquisitely decorated wooden roof. An attractive 17th century small palace with wooden columns set in a delightful garden of Nightingales. The building is octagonal with large central domed hall and a series of small chamber. The domed ceiling of the main reception room is painted in purple on a glittering gold base and decorated with small mirrors. The garden, is visible through the great arches, the most interesting part of this palace are the spandrel title decorations on the exterior showing pairs of often mythical hunting animals. A typical eastern bazaar, one of the oldest and longest roofed bazaar in the world from the Saljuqid and Safavid era. The great bazaar can be entered from one of its several entrances, the main entrance is at end of Royal Square, higher up decorated with fine tile works and remarkable frescoes.The great bazaar has many passages. There are several traditional tea houses and restaurants. 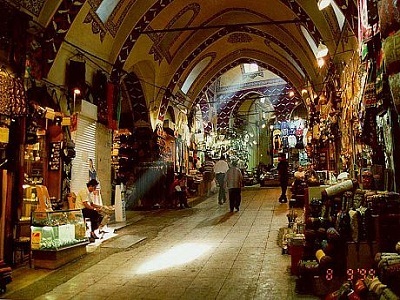 Wondering around in bazaar with its fragrant scents and spices is absolutely a real treat. Often overlooked in favor of the glorious tourist attractions of Isfehan, Shiraz and Persepolis, Tehran has numerous draws of its own to keep visitors busy. 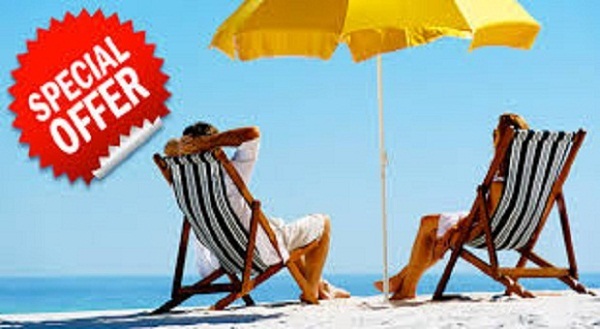 Its tourist spots are spread wide, from the edgy cafes and modern high-rises climbing the slopes of the Alborz in the north to the sprawling suburbs of the conservative south, and from the Old World atmosphere of its grand bazaar to the blinding gaudiness of Golestan and the National Jewel Museum. Tehran offers tourists a little bit of everything, including the best place in which to feel the pulse of modern Iran. Golestan Palace (golestanpalace.ir) redefines opulence. 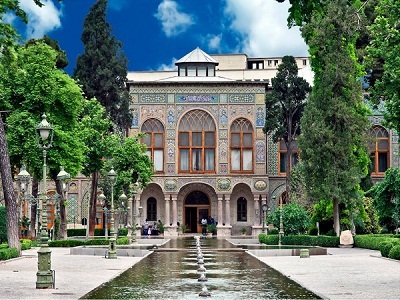 Set in Arq Square in central Tehran and housed within the walls of Tehran's historic citadel, it reflects the affluent decadence of the Qajar Dynasty (1794 to 1925), having served as their court and official residence. After the fall of the Qajars, the Palace was used by the Pahlavis as a reception and is now a hodgepodge of museums open to the public. Favorite buildings within the palace complex include the Talar-e Aineh (Hall of Mirrors), Shams-ol-Emaneh (Edifice of the Sun), the Talar-e Adj (Ivory Hall), Talar Almas (Hall of Diamonds) and four badgirs (wind towers) designed to cool the interior. The Treasury of National Jewels, also called the National Jewel Museum, houses the most impressive jewelry collection in the world. 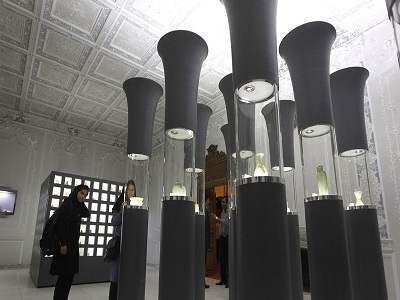 Although the museum is housed beneath Bank Melii in central Tehran, just a short hop north of the bazaar, it is owned by the Iranian Central Bank, its jewels serving as a backup for its currency. Dazzling displays include a nearly 80-pound globe of pure gold decked with 51,366 pieces of jewelry. The treasury only opens three days a week from 2 p.m. to 4 p.m. Among Tehran's other noteworthy museums are the Air Force Museum near Azadi Square, the Coin Museum on Khomeini Avenue, Tehran Museum of Contemporary Art (tehranmoca.com/en/) to the south of the Carpet Museum (carpetmuseum.org), and the Film Museum (filmmuseum.ir), housed in an old Qajar mansion off Valiart Avenue. Freedom Monument, also called Azadi Monument, is arguably Tehran's most recognizable modern symbol, rising from the middle of Azadi Square. Designed by architect Hossein Amanat, it was built at the end of the Shah's reign, reflecting Islamic and Sassanid architectural styles. A popular picnicking spot, the monument has become a focal point for political demonstrations in more recent times. One of the greatest marketplaces in all of Iran, Tehran bazaar is a giant labyrinth of narrow alleys teeming with shoppers, merchants and overladen carts. The bazaar houses a number of impressive mosques, most notably Imam Khomeini Mosque, as well as dozens of covered walkways and specialized sections for everything from copper to carpets, spices and rip-off designer brand stores. It is the best place in town to bargain for a wide array of souvenirs, while the conservative merchants often provide travelers their closest peek into life on the southern side of the city. Unless you're prepared to face the bazaar's daunting rush hour crowds, get your shopping done either in the morning or between lunch and about 5 p.m. 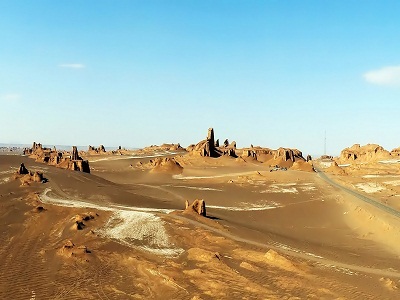 The province of Kerman is the third largest in Iran. Its north-east takes in much of the Dasht-e-Lut desert, and most of the province is largely steppe or sandy desert, though there are some oases where dates, citrus fruits, pistachios and cereals are cultivated. In view of its barren nature, the province is very dependent on Ghanats. (underground water channels), built many centuries ago but still used today. The climate is surprise ingly varied in summer – hot and sometimes humid in the south, while considerably milder in the north. For many centuries the livelihood of Kerman depended on its place on the Asian trade routes, but from about the beginning of the Safavid dynasty (1502-1722) it has relied more on the production of carpets. The barren nature of the surrounding terrain has never presented much scope for agriculture, and today the main activity of the town continues to be the manufacture of carpets and other handicrafts. It has a Zoroastrian minority, though much smaller than that in Yazd. Kerman has a long and turbulent history, and it has only for short spells enjoyed peace and prosperity at the same time. Believed to have been founded in the early 3rd century AD by Ardashir I, founder of the Sassanian dynasty, it was from the 7th century ruled in turn by the Arabs, Buyids, Seljuqs, Turkmen and Mongols, and then until the Ghajar dynasty (1779-1921) by a further succession of invaders and regional despots. 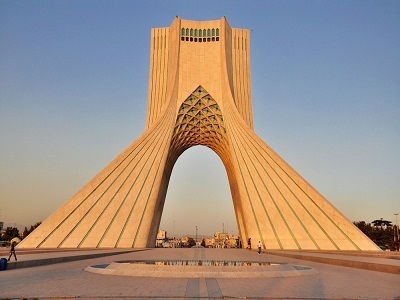 Kerman obtained security under the central government in Tehran during the last century, but its relative remoteness has continued to deny it any great prosperity. The well-preserved and restored Friday Mosque, in the bazaar district, with its four lofty civans and shimmering blue tiles, was built in 1349,though much of the present sutures dates from the Safavid dynasty (rater it's no problem for no Muslims to go inside, The back entrance leads directly into the bazaar. This fascinating, though slightly tacky museum contains a small collection of wax dummies I showing the viewer what to do in a bath house. 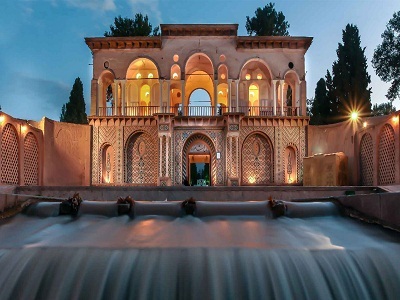 originally built in the 17th century as a bathhouse by the governor of Kerman, Ganjali Khan. The small town of Mahan attracts visitors for its fine mausoleum, and beautiful palace and gardens. Dome over the tomb of Shah Ne'matollah Vali, a well-known Sufi dervish, dates from the early 15th century, but many of the other structures in the small enclosed complex of religious buildings around it were built in the reign of Shah Abbas I or later the mausoleums renowned for its the work, and the seven ancient wooden doors throughout the building. The doors were originally from India, but no-one knows how they got to Mahan. 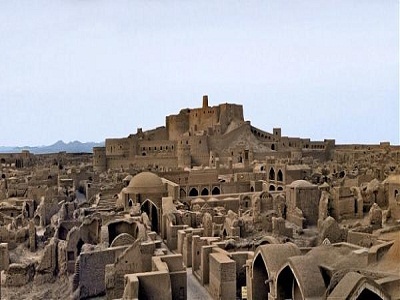 History The citadel and original city of Bam were probably founded in the Sassanian period (224-637) and some of the surviving structures must have been built before the 12th century, but the greater part of what remains dates from the Safavid period (1502-1722). Between 9000 and 13,000 people once lived in this 6km2 ancient city until it was first abandoned following an invasion by the Afghans in 1722. Just when the inhabitants thought it was safe to return, the city was abandoned again in about 1810 when some particularly gruesome atrocities from invaders from around Shiraz persuaded the populace to leave permanently. From then until the 1930s, the remains of the ancient city was used as an army barracks, and it is now completely deserted.